Sintashta (Russian: Синташта́) is an archaeological site in Chelyabinsk Oblast, Russia. It is the remains of a fortified settlement dating to the Bronze Age, c. 2800–1600 BC, and is the type site of the Sintashta culture. The site has been characterised "fortified metallurgical industrial center". Sintashta is situated in the steppe just east of the Ural Mountains. The site is named for the adjacent Sintashta River, a tributary to the Tobol. The shifting course of the river over time has destroyed half of the site, leaving behind thirty one of the approximately fifty or sixty houses in the settlement. The settlement consisted of rectangular houses arranged in a circle 140 m in diameter and surrounded by a timber-reinforced earthen wall with gate towers and a deep ditch on its exterior. The fortifications at Sintashta and similar settlements such as Arkaim were of unprecedented scale for the steppe region. There is evidence of copper and bronze metallurgy taking place in every house excavated at Sintashta, again an unprecedented intensity of metallurgical production for the steppe. Early Abashevo culture ceramic styles strongly influenced Sintashta ceramics. Due to the assimilation of tribes in the region of the Urals, such as the Pit-grave, Catacomb, Poltavka, and northern Abashevo into the Novokumak horizon, it would seem inaccurate to provide Sintashta with a purely Aryan attribution. In the origin of Sintashta, the Abashevo culture would play an important role. Five cemeteries have been found associated with the site, the largest of which (known as Sintashta mogila or SM) consisted of forty graves. Some of these were chariot burials, producing the oldest known chariots in the world. Others included horse sacrifices—up to eight in a single grave—various stone, copper and bronze weapons, and silver and gold ornaments. The SM cemetery is overlain by a very large kurgan of a slightly later date. It has been noted that the kind of funerary sacrifices evident at Sintashta have strong similarities to funerary rituals described in the Rig Veda, an ancient Indian religious text often associated with the Proto-Indo-Iranians. Radiocarbon dates from the settlement and cemeteries span over a millennium, suggesting an earlier occupation belonging to the Poltavka culture. The majority of the dates, however, are around 2100–1800 BC, which points at a main period of occupation of the site consistent with other settlements and cemeteries of the Sintashta culture. ^ Anthony 2007, pp. 374–375. ^ Anthony 2007, p. 371. ^ a b c d Anthony 2007, pp. 371–375. ^ a b Anthony 2007, p. 382. Anthony, David W. (2007). The Horse, the Wheel, and Language. Princeton, NJ: Princeton University Press. ISBN 978-0-691-05887-0. Генинг, В. Ф.; Зданович, Г. Б.; Генинг, В. В.; [V. F. Gening; G. B. Zdanovich; V. V. Gening] (1992). Синташта: археологические памятники арийских племен Урало-Казахстанских степей [Sintashta: archaeological sites of the Aryan tribes of the Ural-Kazakhstan Steppe] (in Russian). Chelyabinsk: Южно-Уральское книжное изд-во. ISBN 5-7688-0577-X. Chelyabinsk is a city and the administrative center of Chelyabinsk Oblast, Russia, located in the northeast of the oblast, 210 kilometers (130 mi) south of Yekaterinburg, just to the east of the Ural Mountains, on the Miass River, on the border of Europe and Asia. Population: 1,130,132 (2010 Census); 1,077,174 (2002 Census); 1,141,777 (1989 Census). The Yamnaya culture, also known as the Yamna culture, Pit Grave culture, or Ochre Grave culture, was a late Copper Age to early Bronze Age archaeological culture of the region between the Southern Bug, Dniester, and Ural rivers, dating to 3300–2600 BC. Its name refers to its characteristic burial tradition: kurgans containing a simple pit chamber. 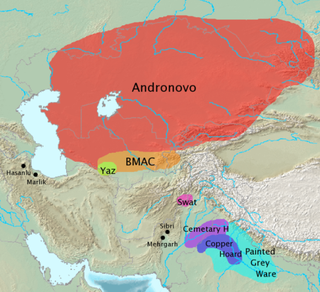 The Andronovo culture is a collection of similar local Bronze Age cultures that flourished c. 2000–900 BC in western Siberia and the central Eurasian Steppe. Some researchers have preferred to term it an archaeological complex or archaeological horizon. The older Sintashta culture, formerly included within the Andronovo culture, is now considered separately, but regarded as its predecessor, and accepted as part of the wider Andronovo horizon. The Indo-Aryan peoples or the Indic peoples are a diverse Indo-European-speaking ethnolinguistic group of speakers of Indo-Aryan languages. 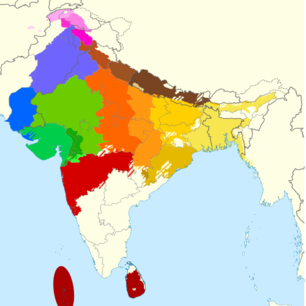 There are over one billion native speakers of Indo-Aryan languages, most of them native to the Indian subcontinent and presently found all across South Asia, where they form the majority. Chariot burials are tombs in which the deceased was buried together with their chariot, usually including their horses and other possessions. An instance of a person being buried with their horse is called horse burial. The Catacomb culture is a group of related cultures in the early Bronze Age occupying essentially what is present-day eastern Ukraine and southern Russia. Potapovka culture, ca. 2500—2000 BC. A Bronze Age culture centered on the Samara bend in the middle Volga region, projecting well east into the Samara River valley. The Abashevo culture is an early Bronze Age archaeological culture found in the valleys of the Volga and Kama River north of the Samara bend and into the southern Ural Mountains. It receives its name from the village of Abashevo in Chuvashia. Artifacts are kurgans and remnants of settlements. The Abashevo was the easternmost of the Russian forest zone cultures that descended from Corded Ware ceramic traditions. The Abashevo culture played a significant role in the origin of the Sintashta culture. The Abashevo culture does not pertain to the Andronovo culture and genetically belongs to the circle of Central European cultures employing the Corded Ware ceramics of the type represented by the Fatyanovo culture. The Afanasievo culture, or Afanasevo culture, is the earliest known archaeological culture of south Siberia, occupying the Minusinsk Basin and the Altai Mountains during the eneolithic era, c. 3300 to 2500 BC. It is named after a nearby mountain, Gora Afanasieva. The Fatyanovo–Balanovo culture, 3200 BC–2300 BC, is an eastern extension of the Corded Ware culture into Russia. Arkaim is an archaeological site in Russia, situated in the steppe of the Southern Ural, 8.2 km (5.10 mi) north-to-northwest of the village of Amursky and 2.3 km (1.43 mi) south-to-southeast of the village of Alexandrovsky in the Chelyabinsk Oblast of Russia, just north of the border with Kazakhstan. It was discovered in 1987 by a team of archaeologists led by Gennady Zdanovich, preventing the planned flooding of the area for the creation of a reservoir. Arkaim is attributed to the early Indo-Europeans of the Sintashta culture, which some scholars believe represents the proto-Indo-Iranians before their split into different groups and migration to Central Asia and from there to Persia and India and other parts of Eurasia. Indo-Aryan migration models discuss scenarios around the theory of an origin from outside the Indian subcontinent of Indo-Aryan peoples, an ascribed ethnolinguistic group that spoke Indo-Aryan languages, the predominant languages of North India. Proponents of Indo-Aryan origin outside of the Indian subcontinent generally consider migrations into the region and Anatolia from Central Asia to have started around 1500 BCE, as a slow diffusion during the Late Harappan period, which led to a language shift in the northern Indian subcontinent. The Iranian languages were brought into Iran by the Iranians, who were closely related to the Indo-Aryans. The Yaz culture was an early Iron Age culture of Margiana, Bactria and Sogdia. It emerges at the top of late Bronze Age sites (BMAC), sometimes as stone towers and sizeable houses associated with irrigation systems. Ceramics were mostly hand-made, but there was increasing use of wheel-thrown ware. There have been found bronze or iron arrowheads, also iron sickles or carpet knives among other artifacts. The Sintashta culture, also known as the Sintashta-Petrovka culture or Sintashta-Arkaim culture, is a Bronze Age archaeological culture of the northern Eurasian steppe on the borders of Eastern Europe and Central Asia, dated to the period 2100–1800 BCE. The culture is named after the Sintashta archaeological site, in Chelyabinsk Oblast, Russia. 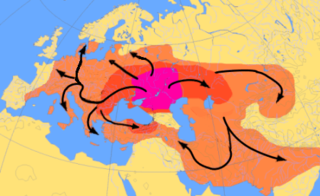 The Indo-European migrations are the migrations of the peoples speaking the Proto-Indo-European language (PIE) towards the locations where Indo-European languages are spoken today, particularly the earliest migrations following the split of the ancestor language. 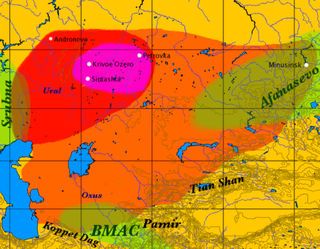 According to the most widely held hypothesis, the Kurgan hypothesis, the earliest proto-Indo-European speech community was identical with the archeological Yamnaya culture, and other related cultures in the Pontic–Caspian steppe, at c. 4000 BCE. Their descendants spread throughout Europe and parts of Asia, forming new cultures with the people they met on their way, including the Corded Ware culture in Northern Europe and the Vedic culture in the Indian subcontinent. These migrations ultimately seeded the cultures and languages of most of Europe, Greater Iran, and much of the Indian subcontinent. Alternative theories, such as the Anatolian hypothesis see the migrations as starting in Anatolia, at a much earlier date. The Ural Mountains extend from the Arctic Ocean in the north to the Ural River and northwestern Kazakhstan in the south over a distance of 1,500 mi (2,400 km), the boundary between Europe and Asia. Human occupation begins in the Paleolithic and continues to this day.